Stitch on graduated stacks of seed beads, starting with just two and working up to around five. Arrange the stacks along a crazy waving line that covers several inches of your necklace. When the stacks are completed, stitch them together along the top, adding two or more beads between each stack so that they ruffle at the top. Nestle pearls and other accent beads into the deep wells formed by the ruffled stacks. 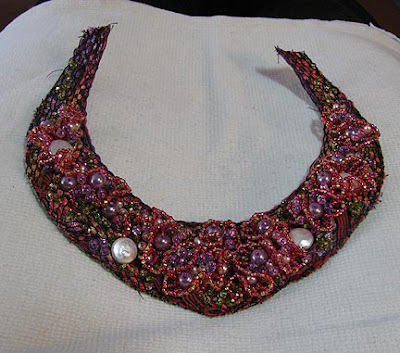 Add more lengths of ruffled stacks and accent bead embellishments along the necklace. 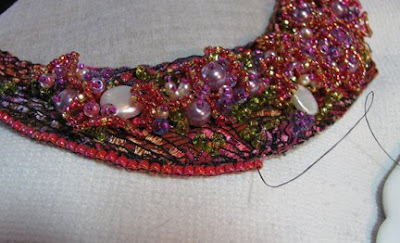 I chose to only use a few accent beads on the top couple of inches of fabric on each end. When the whole piece is bead embellished to your liking, cut a bottom piece of ultrasuede. Stitch on a piece of wire at each of the two ends: curl the end of the wire into a circle so that you can stitch it firmly in place on the back of the top fabric. Glue the top and back together lightly. 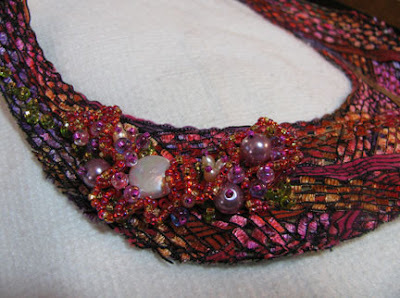 Using size 8/0 seed beads, stitch all the raw edges together using edging brick stitch. Next time, the finishing touches, including the addition of the lovely CZs! Gorgeous! Thanks for sharing the tutorial. Being sewing challenged, I would have never thought of the ribbon idea, but I'm thinking that I finally have to take the leap and learn how to use the sewing machine. 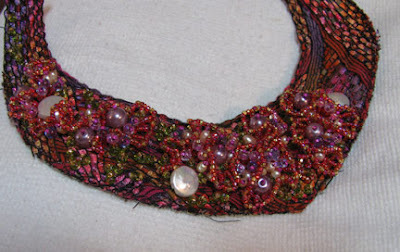 this is gorgeous - I am becoming a fam of bead embroidery and I think a beaded collar is in my future. Such fun. Well Jean, your bracelet has left me wanting to see more from you! Cyndi, this is just beautiful! What about ruby plethora?